Week 4 was a rough week, as far as training went. I was unmotivated and tired, and I slacked off a bit at the beginning of the week. By the end, I found new motivation, and week 5 has started off on a much higher note. I’m hoping that the momentum continues through the holidays—they’re coming up faster than I realized! I was tired and sore and unmotivated on Monday. I spent about 20 minutes foam rolling while on my lunch break, and it was a painful process. I didn’t enjoy it one bit. But my IT band felt better for the rest of the week, so it was worth it. Tuesdays are running days, but I wasn’t feel well in the morning, so I decided not to run. I regretted it about halfway through the day, but decided that Ole and I should go exploring rather than run in the warmer part of the day. 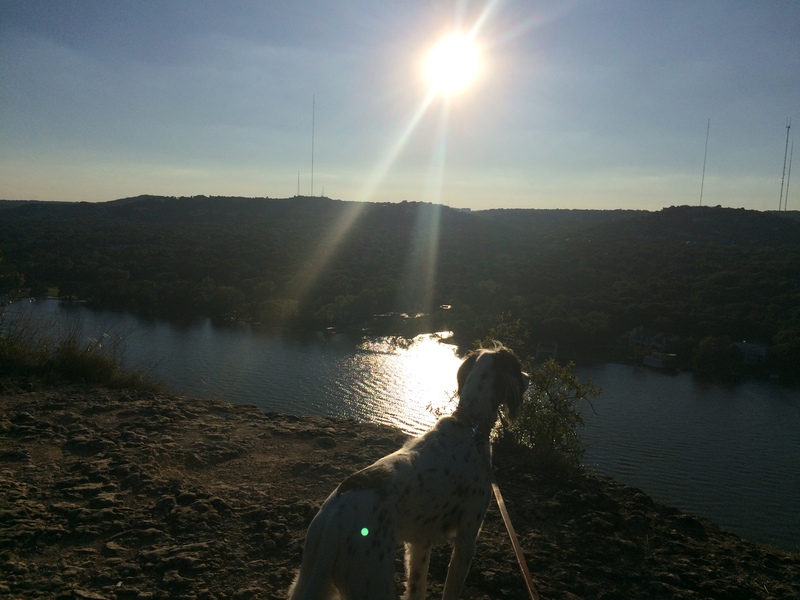 So we trekked up a whole lot of stairs to see the view at the top of Mount Bonnell. It was beautiful. Ole had a rough morning—he had a cut on his paw and was limping around. So I left him behind and ran on a treadmill in the apartment complex gym rather than driving somewhere to run by myself. I hate treadmills, so it was miserable. 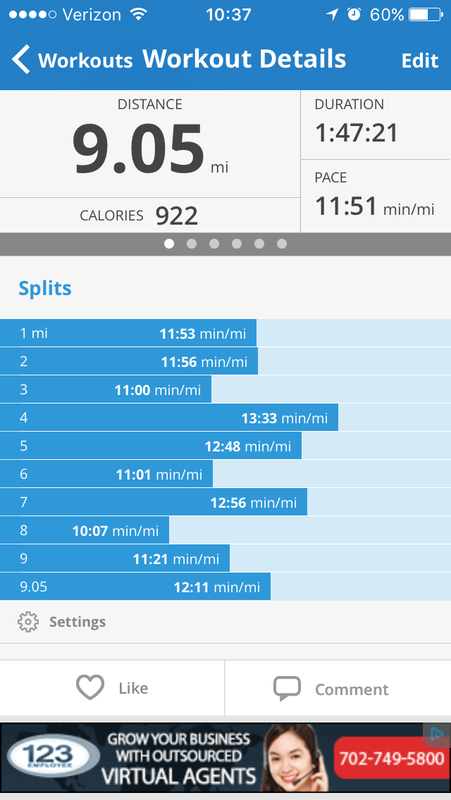 I did an intermediate program on the dreadmill, so it was changing the percentage of incline and the speed throughout. I definitely felt bleh at the end. Damn dreadmills. But it was better than nothing, I suppose. I was back in the Big Apple this week for a quick trip, and my flight was at 6 am. I had a layover and then had to go to the office, so I was pooped by the end of the day. No working out for me, but I did walk a lot through airports. I graced the Big Apple with a presentation at work on Friday morning, and then had to catch a flight back home. I didn’t get home until after midnight, so there was a second day that I did a lot of walking through airports and no other exercise. I felt gross and bloated by the time I got home, so I knew I had to get back on the wagon on Saturday. Guys, if you haven’t watched any of Tone It Up’s workout videos on YouTube, you should start. They’re free (!!) and they’re amazing. This lovely Saturday morning, I combined some moves from different workout videos I’ve watched of theirs and created my own workout. It consisted of Starfish lunges, push ups, planks, and Russian twists with weights, along with some modified presses, flies, and tricep dips while in a bridge position. I felt much better at the end of it, almost like my Big Apple trip didn’t disrupt anything at all. This was definitely my longest run in a year, and my longest pain-free run in almost two! I discovered that there’s a vast majority of a trail where people hike with their dogs off leash, so I let Ole off the leash for most of this. I’d guess he ran near 15 miles, total. He’s a goof. I was super slow, mostly because I was trying to keep an eye on him and had to constantly stop to make sure I knew where he was, but I did it. And I hardly walked—that’s a win! Not only that, but I got some new trail shoes on Saturday. It may not have been my brightest move to do a nine-miler in brand new shoes, but it worked out fine. I just have a little tiny blister on the bottom of my left foot—hardly anything. And guys, I love these shoes. Ever since I’ve started running, I’ve been in the Mizuno camp for all of my running shoe needs. (More specifically, I wear Wave Inspires.) But I didn’t feel comfortable blindly ordering trail shoes off of Mizuno’s website, since I know so little about trail shoes. I wanted to try them on. So I went to a locally owned running store (my favorite kind!) and tried some on. 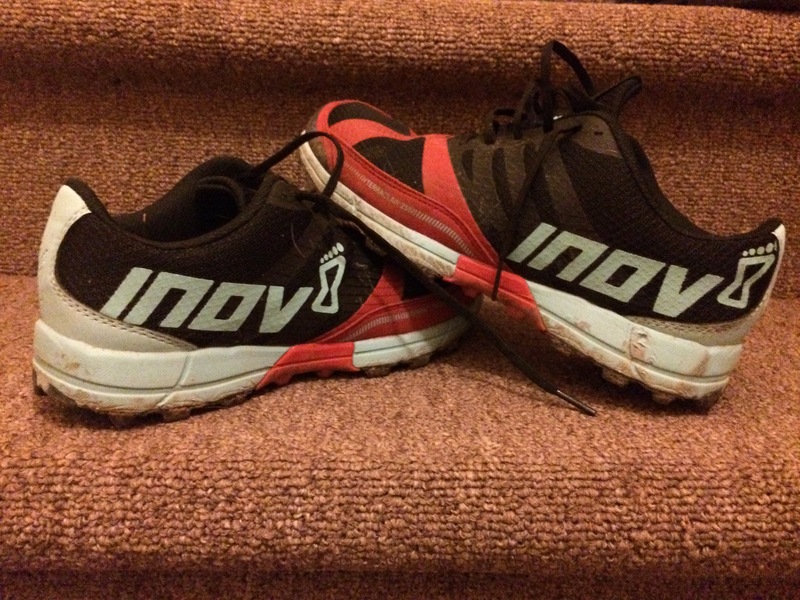 A very nice girl got me in some Inov8s, and I fell in love. They’re light as a feather and grip the rocky terrain something wonderful. I’m so happy with that purchase, I could shout it from the rooftops! Like I said at the beginning, I have high hopes that week 5 is going to go much better than week 4 did. We shall see. Less than five weeks until my trail half!